Cue Homer Simpsonian drooling. There exists such a thing as a deep-fried fluffernutter. The photo literally makes me shiver with delight. Which, unfortunately, is dampened quite a bit by the presence of banana along with the Fluff and peanut butter. But now that I know such a delicacy exists, I can set about re-creating it, minus the dreaded bananas. 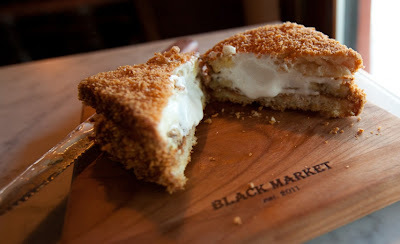 Should you be in the San Fernando valley area, head over to Black Market Liquor Bar for a deep-fried fluffernutter and one of a selection of what look like terribly promising cocktails.